Presents an elegant appearence and reflects light. Not only are mirrored coffee tables elegant and luxurious in appearence, but they also create a sense of spaciousness as light reflects off the surface as the surface reflects everything above it. 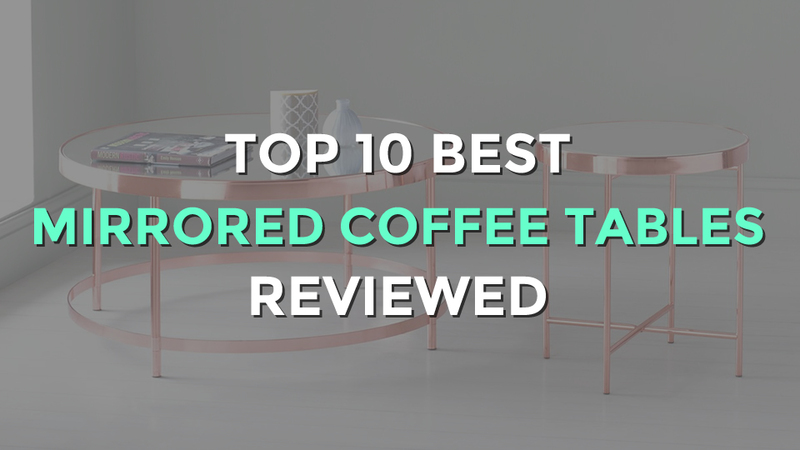 If you like the idea of this, then check out our top 10 best mirrored coffee tables in round, square and venetian designs. The ASPECT Fino Mirrored/Glass Round Coffee Table is a neat and compact fifties style table that has been brought up to date with its tubular steel, copper finished legs, which support a circular mirror top. 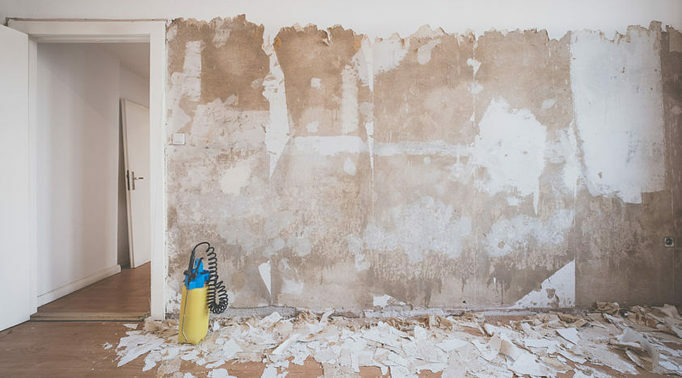 It would look wonderful at the end of a sofa, or between two armchairs. The Heart of House Piazzo Mirrored Top Coffee Table has a particularly striking design, with a high gloss chrome criss-cross frame that supports a rectangular plinth top in bevelled mirror glass. This is a chic coffee table that could look equally at home in modern or retro decor. With a white ash base structure and sitting on legs ending in small feet, the pretty Fleur Coffee Table from Next would be an attractive addition to any living room. 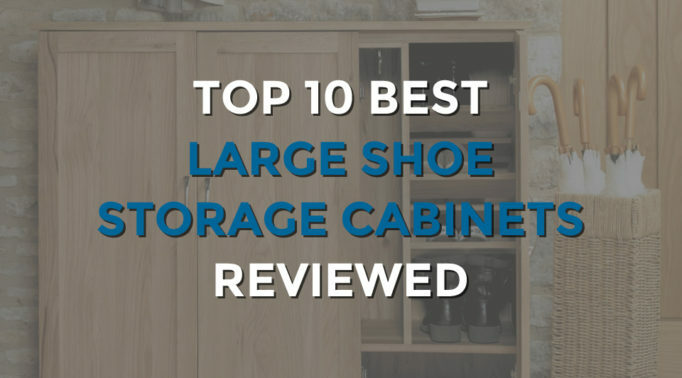 Features include bevelled mirror glass panels fitted to the wooden background and a good sized useful drawer finished with a dainty crystal pull – perfect for housing necessities such as remote controls and other household items. The Mirrored Coffee Table from Paradox has a sturdy, angular shape that gives it an almost masculine feel. 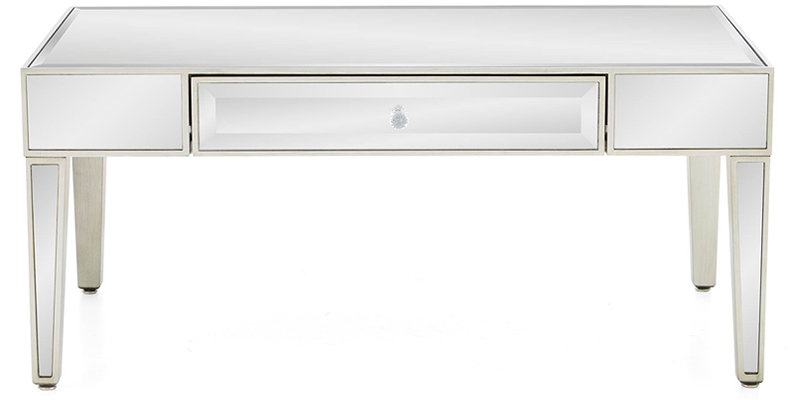 The legs are slightly angled and the entire table is mirrored in bevelled glass with an interesting double panel feature around the upper sides. We could see this table giving your living room the feel of a modern gentlemen’s club, perfect for holding your whisky glasses. One of the best mirrored coffee tables for displaying treasured objects in a gallery style, the Box Mirror Table by Kelly Hoppen is a chic lacquered cube (available in white, grey, taupe or black). Its inset mirror top makes it the perfect base to display and reflect special items such as a sculpture or beautiful statement plants such as orchids or cacti. 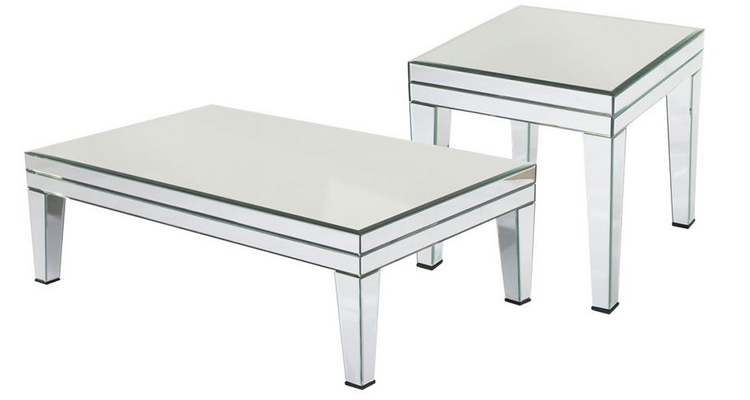 The Mirrored Coffee Table by Debenhams has a deceptively simple shape with clean, elegant lines, and is fully mirrored on each surface including the cuboid legs. Slightly smaller than many rectangular coffee tables, it is nonetheless a useful size and a design that would blend seamlessly into most modern homes. 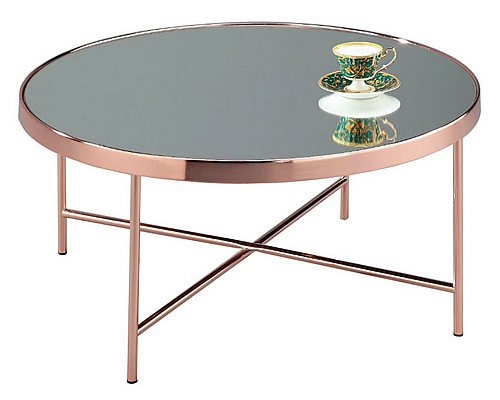 The Venetian Mirrored Coffee Table is a sleek oblong sitting on small unobtrusive feet. With an MDF base and fully mirrored surface. 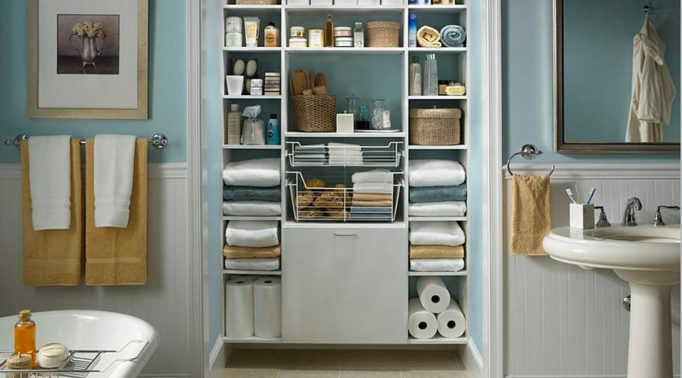 There is a useful shelf inside the unit suitable for magazines or display items. 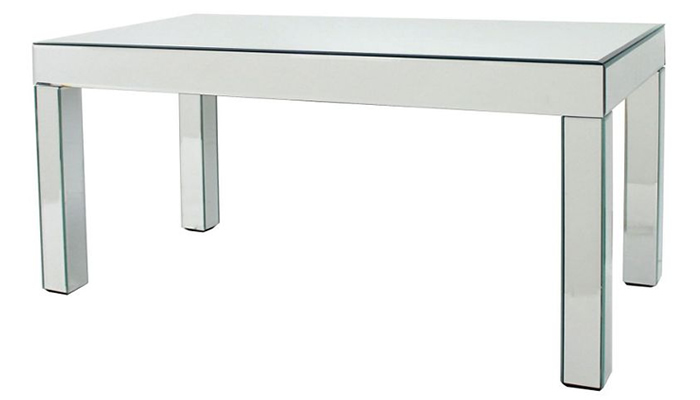 This is a great coffee table for a minimalist setting, with its modern design and light reflecting properties. 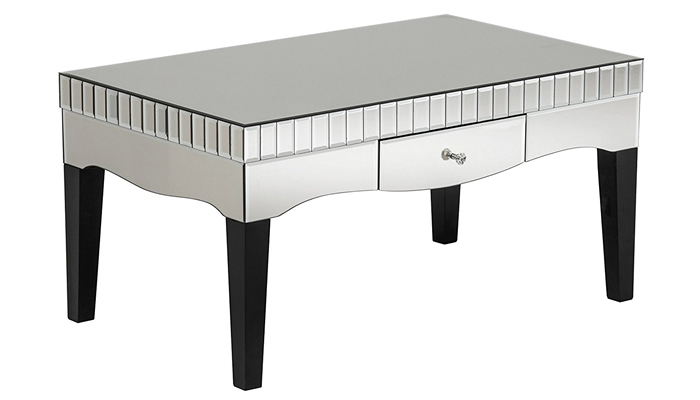 For a distinctly glamorous Art Deco look try the Vintage Mirrored Coffee Table by Alterton Furniture. 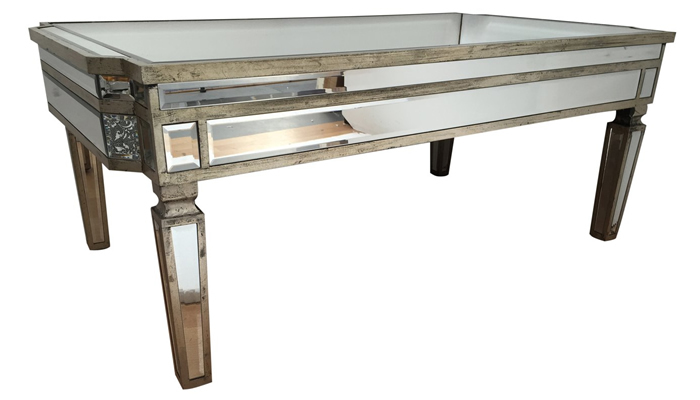 This table features antique silvered wood edging with bevelled mirror glass panels to every surface, including the legs. This coffee table is a substantial looking piece furniture which would be very much at home in a living room inspired by stately homes! 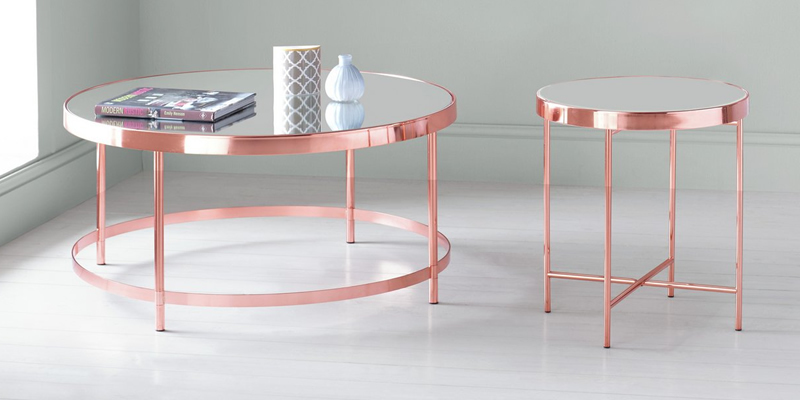 The Collection Round Mirrored Top Coffee Table takes its cue from the atomic era inspired designs of the 1950s, but brought up to date with an attractive contemporary copper plated finish to the circular metal frame. The table sits on four tubular legs which are banded with a lower hoop and finished with a deep upper rim. The flat round mirrored top is just perfect for an evening with cocktails! One of the best mirrored coffee tables for a highly decorative yet useful piece of furniture, the Premier Housewares Boulevard Coffee Table is a rectangular French style table manufactured in MDF and mirrored on all surfaces, aside from its black tapered legs. Bevelled mirror mosaic tiles line the top of the sides, while curved mirror panels provide a shapely edge to the base. 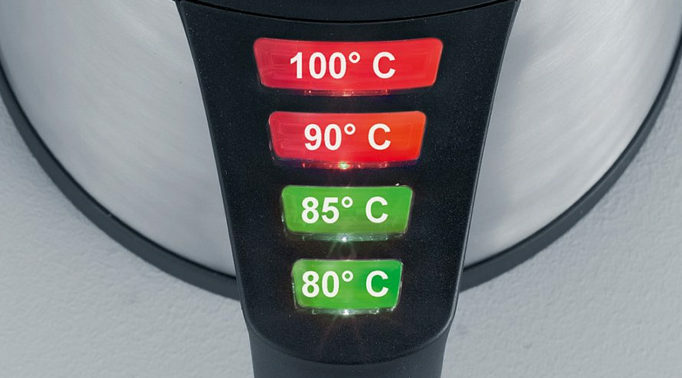 This table also has a small drawer to house essentials such as remote controls, with an attractive crystal knob.